Compelling, sometimes-unbelievable life experiences lead to prayer, the Bible, and salvation. This captivating variety of the personal includes; accounts of his early years growing up in an area of toxic hexavalent chromium exposure, experiences in missionary basketball, and finding true love while walking with his youngest daughter through her encounters with autism and schizophrenia. The author's commentary reveals the earnest heart of a father who longs to share all the greater things of life with his grown children. 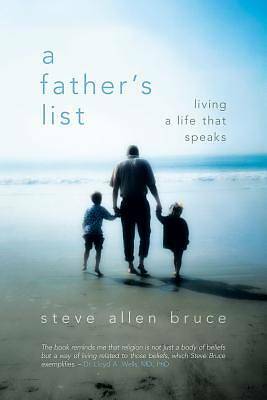 Steve Bruce's A Father's List provides surprisingly honest snapshots of how Bruce has approached forgiveness, fear, spiritual war, and sin--through restoration by grace, mercy, faith, humility, longsuffering, obedience, miracles, and love.Have you ever- loved someone so much that "you" simply disappear and they are the only one in the room?- wished you could roll back the hands of time and get a "do-over"?- had something or someone teach you about humility?- had someone in your life who has hurt you deeply that you need to forgive?- sat bedside with a loved one who is suffering? - experienced a miracle, something that you know could have only come from God? - experienced grace and peace in your heart when you knew you should be falling apart? - experienced God's mercy in your life, and are so grateful it takes you to your knees?